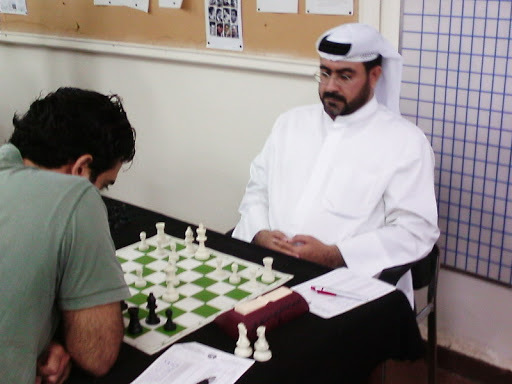 Hashem, Khaled(KUW) won top unrated on tiebreak over Al Azmi, Khalaf(KUW) both scoring 4/9. You can look forward to a nice tournament report on Hashem’s site Kuwaitchess. He was part of a large group of Kuwait players I had the pleasure of meeting during the tournament. Perhaps we will see a similar group in the coming Budapest Open(August). Medve, Mark; Grimm, Daniel; Csati, Oliver and Czegledi, Barna Jr. had outstanding performances. Krstulovic, Alex and Kozak, Adam also confirmed their status as rising young stars of Hungarian chess. I was crushed in model fashion by my unrated Kuwaiti opponent after missing the wrong plan earlier in the middlegame. After that, there was no turning back as white found some nice maneuvers to achieve a dominating position. Hashem is one of the many cool players I met from Kuwait. He advised my to make a FB Fan Page for the blog. So it’s on my big To Do List (How to Make a FB Fan Page) now. He also has a cool site Kuwaitchess! and a Youtube Channel Youtube-Kuwait Chess. Here’s an example. Here’s my round 6 game. White is ideally placed. How should the game continue? Al Hajeri,B(KUW-1978) managed to beat both Koczo,K and Farkas,R in the same tournament so I had to see how as I have recently lost to both these strong local players. Favorite White Opening: 1. e4! Farkas,R had been taking some risks to get winning chances against a tough Petroff Defence. Black has just attacked the queen with 20..Nd4 and is taking over the game. What should white do with the queen?